The Packard Patrician is a sedan which was built by the Packard Motor Car Company of Detroit, Michigan, from model years 1951 through the 1956. During its six years in production, the Patrician was built in Packard's Detroit facilities on East Grand Boulevard. The word "patrician" is Latin for a ruling class in Ancient Rome. For 1955 & 1956 it was ALSO called the "400". The highest trim level available was the Packard Patrician 400. The Patrician 400 replaced the previous model year's Super 8 model range. The car was easily identified from other Packards by its chrome trim; in 1951 the model featured three chrome ports on its rear fenders and in 1952 the car featured four chrome ports. 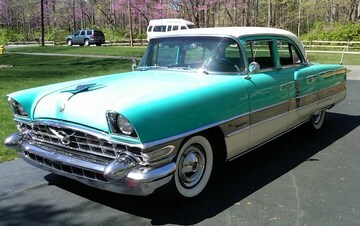 Patricians and 300s also sported a slightly revised grille which included chrome "teeth" in its oval area in 1951. That change occurred to the 250 series soon after introduction. The Patrician 400 was available only as a premium, four-door sedan, outfitted with high-grade upholstery and chrome trimming within. For the 1952 model year, Packard retained the services of noted interior decorator Dorothy Draper to bring a fresh look to the interior color scheme. Wilton carpeting and hassock-style rear passenger foot rests were also included with the car. With a list price of $3,662 it also was the most expensive regular Packard offered. The automobile rode upon a 127-inch wheelbase shared only with the 300 sedan. All other Packards had a wheelbase of 122 inches.